welcome, click away, and have a good time. to $76 for that damn cable, which discouraged me a bit. you program that thing....I wouldnt even dare try...ya must be genius. bit ADA the best out there now, and is this all that matters in a soundcard? It's not difficult. You need a MIDI adapter and 2 MIDI cables. >I dont think my sound card has a Midi in out port. > to $76 for that damn cable, which discouraged me a bit. to unplug the drum machine. >did you program that thing....I wouldnt even dare try...ya must be genius. (www.brambos.com) that'll keep me busy. > What sound card do you use? Does SB live have midi in/out with it? SBLive Platinum. With the LiveDrive which has the MIDI in/out. out there for the same price. >I have soundMAX which came with the computer. It sounds fine. > I am not sure if I should buy another one. > get all this info? where they had sound card reviews, but I can't find it anymore. update Ripper. Too much fun stuff to do! A 15 / 30 dual watt soldering pencil from Radio Shack will work well. torches, and the 15/30 watt unit is my most recent purchase. will give you a ton of time to watch the solder flow. wire and have a good time practicing. both pieces of work to be soldered. solder at the point where all three meet. of a good solder joint. too much of it. I doubt that it's good for you!! concerned, you absolutely have to have well tinned wires to start with. nice and tight and straight and all the strands are nicely twisted together. it! Tin your iron before you put it down, and before you turn it off, too). bigger the blob the better the job" just ain't so!!! residue can make a joint impossible to solder right. Just my 2 cents in the mix here. solder flow easily onto the metals parts. at least the proper temperature, a good solder joint can be formed. steel guitar. A steel guitar has no intonation adjustments. So here is a contest question. more in tune and the chords more rich and harmonious? piano's they would have to be tuned differently in order to 'sound' in tune. with itself and properly in pitch with a tuning standard, A440 might need to be A442 or A443. This is really an odd thing that harmonics do with our brain and psychology. overtones, harmonics, and your particular instrument and the key you are playing in. and the song. Mainly, if it sounds good and pleasing that is all I care about. for the higher track counts. virtual tracks, at least until you start to run out of disk space. and all of them in between. more audio sources as well as provide even greater dynamic range. this. It is called noise. electronics and board layout design to keep it lower. NOT 1.000. The difference is called truncation error. operations -- with more and more accumilated truncation error. even if the final output is truncated to a 16-bit CD. rate/frequency. Nor does it have anything to do w/ the Nyquist frequency. the more accurately the entire something can be reconstructed, in the end. input waveform. But it's not going to be entirely accurate. waveform. At 44.1kHz, 44,100 samples are being collected every second. Hope that this helps... Questions, bring 'em' on. Thanks Dar once again you are a wealth of information!! --I do not believe the bit depth has anything to do with the frequency range. very high, but then you would only be able to stick one song on the disc! compromised and settled on 16 instead of 24 or 32 bits. for 16 bit audio 60 minutes of music would take up 635 MB of space. 24 bit audio for 60 minutes would be 953 MB of space. That's 50% more space! bit and you SUM them all together in your mix you will introduce less error. some expensive pro gear to hear the difference. easiest way to look at this sampling thing is to think about graphics. reproduction is. Does this help for all you non-math people? I am following your conversation and I find it very educating even though I don't hear any difference between 16 / 24 bit samples. I have one question. Somebody mentioned quantizing. I saw a QUANTIZE option in Cubase VST which I use for recording my stuff. What does quantizing meen? What does it do to the tracks in Cubase? I don't use Cubase, but I use Cakewalk. So, let me take a guess. In cakewalk quantizing means your notes so they can only fall on certain beats or parts of a beat. For example, Lets say you are going to record in MIDI a piece that is very similar to the opening of Van Halen's Running with the Devil. Those opening bass guitar beats are quarter notes. If you knew that you were going to be playing quarter notes you could tell your software to snap any notes that are slightly before or after the beat to the nearest quarter note. This is what Quantize means in Cakewalk, I am guessing it is similar in Cubase. This is only for Midi recording. The quantizing refered to in other emails in the context of analog to digital conversion is different. That has to do with how many discrete representations of an analog signal you can have. The higher the bit rate the more discrete levels of representation are allowed and therefore the more accurate it is. 24 is even more at 2^24 = 16.7 million levels. When I say levels I mean this. Lets say your guitar signal goes from 0 to 1 Volt and anything in between at all different frequencies. If you drew that signal on graph paper, you would need 256 lines on your graph paper. Each row on the graph paper would be an allowable digital level. With 16 bit recording you could have 65K lines. That's a lot of lines and sounds pretty accurate, doesn't it? At 24 bit you would need 16 million lines on your graph paper. Each line could be a valid digital signal level. Quantizing means the software looks at the notes in the track (or whatever area is selected), and then aligns the notes to the nearest value you define. Say you have tapped in a midi drum track, but you got a little sloppy and didn't hold a steady beat. You could quantize the track by specifying, say, the nearest eighth note. That would take all the drum hits in the track (or however much of it you have selected) and align them to the nearest eighth note. No more sloppy drum line! Usually you can specify how tight you want the software to align to (in % usually), and also you can quantize note durations, too (by % as well). All of these things help tighten a track up, but by specifying, say 75 or 80% quantize, the software will only move the notes 80% of the way towards the nearest eighth note and adjust the durations by 80%- that keeps the track from totally sounding like a machine (like it would if you put everything exactly on each eighth note) . Thanx Mike and the others. You realy helped me with this. I would like to say that this list is great. I learned a lot here. i heard on the grapevine that on Metallica's black album, they spent months manually quantizing every single hit of of Ulrich's drums - Let's face it, the guy does need some help! I do have 2 questions about the volume output from the RP 2000. I really hope that someone can help me with it. different. Naturally the volume output for solo's is higher as for rhythm. configuration of the preset) is to high/strong for my amp (guitar input). programmed. What must I do to sure it doesn't happen. connection on the RP 2000.
in my opinion. I can't believe Digithech let the unit out the door this way. still not entirely satisfied with this aspect of the unit!! output stage so that the loudest patches you have don't freak your amp out. it'll bypass the gain on your amps preamp as well. >>The output volume of every preset is different. patch's "Overall Volume" to what your ear perceives is right output level. volume pedal to volume post. I am thinking to buy one extra volume pedal. That will give me the freedom to assign the expression pedal to what I want. On Edit mode, i modify a Preset level to, say 75.
touched the pedal, all my settings changed..
Am i using this whole thing correctly ? that the unit reads the pedal position when you change patches. unit seems to work for me- I've never seen it covered in writing anywhere!! How Do You Run Your Unit in line? Is anybody out there using any pedal boards (mine is RP2K) going into the fx loop of a Fender Hot Rod Deville? Mine's a 4x10, if that matters. My real question is this: how do you string things together? Or maybe something I haven't thought of yet. Wich preamp do you want to use? If you want to use Fender preamp and leave RP2K just for fx, use the first option. Otherwise, if you want to use the RP2k preamp section, use the second option. Keep in mind that if you plug your RP2K in the normal input (not in the fx-loop) you'll have two preamps before the power amp. into the mix allows me also select one amp over the other, or combine both. get an enormous variety of sounds. But I still want a 2120VGS!! Ive got a hotrod deluxe 1-12. I run the guitar into a CryBaby to a morley a/b/y box, One signal into the rp2k, one into my ART preamp, the rp2k goes out into a stereo volume pedal , from there a single run to one of the inputs on the hot rod deluxe. That leaves the other to go to the pa board. The Art goes out direct to the other input on the hot rod deluxe. these levels are adjusted for_even_ before they get to the amp. It is so slick for live. For some reason when both inputs of the hotrod are used, it changes the voltage reguirements and the sound will sound better (awesome). It will only go about half way up, before that feedback squeel thing happens ( the volume on the hot rod). I also use a morley volume pedal at the preampout/powerampin. , just the volume pedal there, it allows me to control the total sound output volume. and run the input hot, I dont have to touch my amp once, after inital volume settings. 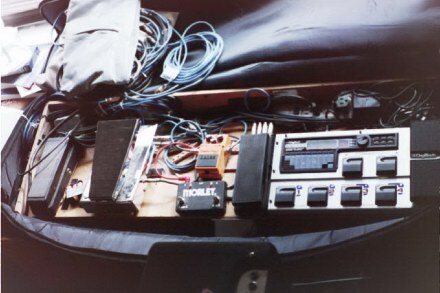 All this is mounted on a pedal bourd 4' long and a cable bundle of 6-25 foot 1/4' cables and one mic cable cannon plug(for the talker/mic ) also powerstrips on board so there is just one power cord( for all the warts and power supplies ect). If you want to try just turn the volume on the rp2k down to just about on and plug both (stereo) into the volume controled input on the amp turn it up just before the squeel. Use a volume pedal at the effects loop. then turn the rp2k up till it feels good. I rewired my Sunn folded 2-15 sh, to run in 16 ohms (I prefere 4ohm's but this way I loose a cab. ), so it pluggs right in and I dont have to have still another cab to run in series to get 8 ohm. It bypasses all of your amp controls (except maybe the master volume depending on your amp), but it sounds best this way. Oh yeah, leave the cab emulations off. first and then the RP. My question is does it matter if the wah comes first? behind) the rp then you will also affect any and all of the rp FX. Personally, it sounds better between the guitar and rp. Hope this helps and doesn't give you a headache ;-). wondering if anyone using there RP100 in the effects loop? plugged either into the amps main input or the effects return. into the effects loop of your amp. But either of these would be "right:"
(and it works for me). the amp models and some patches setup not using them. amp, (It has killer distortion!). way, because reverb goes behind everything else typically. Now what if I ran out of the guitar into an A/B switch and did both setups? for, Placeing effects in order. Nice ideas! at 3/4 or so. Is there a better way to connect myself to this amp? hey the effects send/effects return,,,, or some amps (like mine) have something called pre-amp out/ power amp in. there close to being the same. the effects send /preamp out are usualy plug sockets, 1/4"holes, on the back or frount of the amp some amps have this and some dont. there usualy marked. The effects return/ poweramp in, is a different animal it is ,(in the case of the effects return, the way back for the effects send where ever you sent it, it does not have to be used, if the effects send is used, it can , not be used or used, it is also sometimes controled by a on/off switch, or a gain pot. The poweramp in is also an a effects return but this baby disconects the preamp of the "combo,your amp" you are useing,(that is the internal preamp or the pre section of your combo,amp) by just pluging a plug into it, and usualy has no gain control. (this is changeing latley) so you are by passing the preamp or your amp,combo, and just useing the internal amplifier section of the combo,amp. These are very handy and worth every cent in the useage dept. As the technology moves on, it sort of goes backwards to the use of seperate preamps and amp of the late fifties when the hi fi revolution happened. > are really useless. Programming it is a cinch. > know if there are any benefits to using the effects loop? to work through the regular input was a waste of time, I could never make anything sound good. units, and your amp, were designed for. of some sort for the bulk of our sounds. Can I use a a/b/y bow to switch the inputs of my amp to either have the rp there or the regular guitar plug? Can I switch the input at the effects return with an a/b/y box? selectively switch between either the main input or the effects return. final sound because I've never tried it. overdriven. This is exactly the way I have mine setup. what I've discovered just by swapping cords all over. Good luck. Hearing a Neal Schon challenge made me remember something I saw on the official Journey website. This is a quote from a discussion group on the Journey site. I figure I'd share my recent DS-1 experience with everyone. Guys, if you ever have a chance to try the DS-1, give it a try. simply drop all of the knobs to 0 except the level knob...and crank that one. And you've got sultry, smooth, liquid sustain for days.